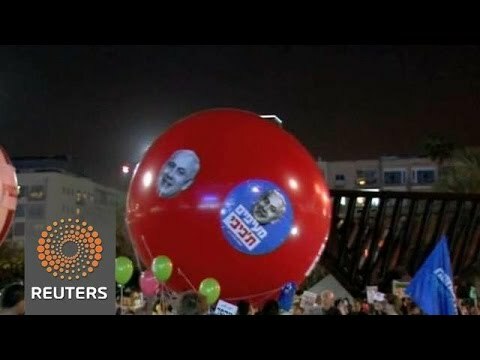 Tens of thousands of Israelis rallied on Saturday evening, in Yitzhak Rabin Square, Tel Aviv, calling for the current Israeli Prime Minister to be replaced in the upcoming parliamentary elections, according to Israeli and international media. The event’s organizers, Israel Wants Change, said that more than 35 thousand people attended, while other officials estimated that between 25,000-30,000 protesters turned out to the rally. The organizers and key speakers said the rally was to express support for a return to a way of life that is normal and sane, with dignity and peace between Israel and its neighbors. The rally also called for a change in Israel’s priorities, refocusing on health, education, housing, wages, the cost of living and the elderly. Former Mossad chief Meir Dagan, who addressed the rally, told the crowd that Israel faces its worst crisis ever under Netanyahu’s leadership, according to WAFA correspondence. “No one denies that Iran’s nuclear program is a threat, but going to war with the U.S. is not the way to stop it,” Dagan was quoted by Haaretz. “I am afraid of our leadership. I am afraid of a loss of determination, of a loss of personal example. I am afraid of hesitancy and stalemate, and I am afraid above all of the crisis of leadership, a leadership crisis that is the most severe ever here,” Dagan said. In recent weeks, Dagan criticized Netanyahu’s decision to speak before the U.S. Congress, and he continued his criticism at the rally, saying that he has never seen such stagnation in Israeli politics.